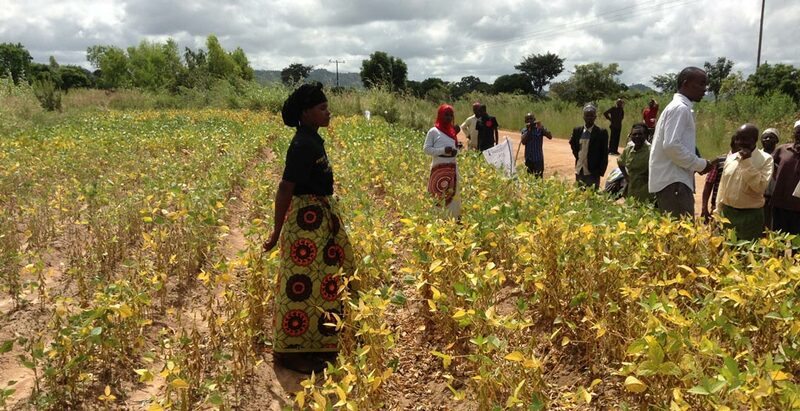 Soybean farmers in the Machinga District of Malawi say a more organized soybean market, like the tobacco market, can spur more production of the crop in the district. Senior Group Village Headman Mbere from the area of Traditional Authority Chikweo in Machinga said this during a field day in his area organized to brief farmers about the harvesting practices of the crop in the area. The field day was organized as part of the Malawi Improved Seed Systems and Technologies (MISST) project implemented by IITA and funded by USAID. The area falls under Chikweo Extension Planning Area. “Let me thank IITA and USAID for bringing this project to our area. Soybean is a good crop because it is much easier to cultivate than tobacco. The labor requirements are less for soybean than for tobacco. The other advantage is that soybean can also be used as a food crop unlike tobacco. However, you will notice that farmers still grow tobacco because they are assured that the crop has a ready market on the auction floors. Let me call upon government and other development partners like IITA to assist in coming up with ready markets for crops such as soybean so that farmers are motivated to produce more”, explained Senior GVH Mbere while addressing hundreds of farmers who attended the demonstration field day held at the farm of Dyna Pichesi. Pichesi said she has discovered the advantages of soybean farming as it involves less labor and inputs, compared to the other cash crops such as tobacco. “I think I will continue with soybean farming because I have noticed and learned that growing soybean is less involving compared to other crops. Although finding markets had been a challenge for soybean, I believe that if we as farmers produce more, we are eventually going to attract buyers to come and buy our produce”, explained Pichesi. Speaking on behalf of IITA, Joseph Mhango, the Seed Production and Technology Dissemination Specialist, expressed happiness and promised the farmers of IITA’s continued support to them. “Firstly, let me thank each one of you for coming to this field day. That is an indication of your eagerness to acquire new skills and knowledge in soybean production. And I urge you all to keep the knowledge you have gained from this day so that you produce more. As for the seed varieties, we have all seen today that Tikolore has done very well despite the fact that this area has experienced less rainfall during the 2015-2016 farming season. We will therefore bring more Tikolore in the next farming season so that more farmers benefit”, revealed Mhango. 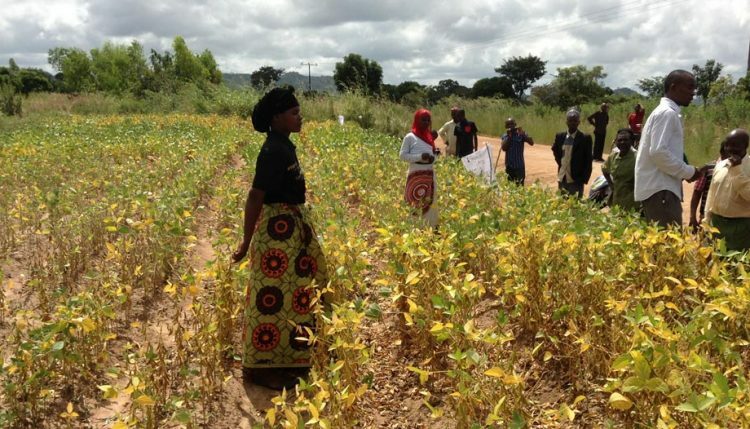 Mhango also explained to the farmers that Malawi now has an Auction Holdings Commodities Exchange (AHCX)―a market platform for many crops including soybean where farmers can realize better prices. He, however, encouraged the farmers to form cooperatives so that they have more bargaining power for prices. “On the availability of markets for soybean, yes, let me agree somehow that not many farmers―especially in the remote areas―know where and how to sell crops like soybean. However, it may not be completely true that there is no organized market for soybean. Since 2012, there has been an organized auction-based market for soybean at Auction Holdings Commodities Exchange. All you need to do as farmers is to organize yourselves into cooperatives so that you can gather bigger volumes of soybean for sale. As farmers you also need to develop the spirit of keeping your produce for later so that you sell when prices improve”, Mhango said. During the field day, over 50 new farmers expressed an interest in growing soybean under the MISST project and had their names registered in readiness for the next cropping season.